Our destination as we left Makemo was Fakarava, the second largest atoll in the Tuamotus. 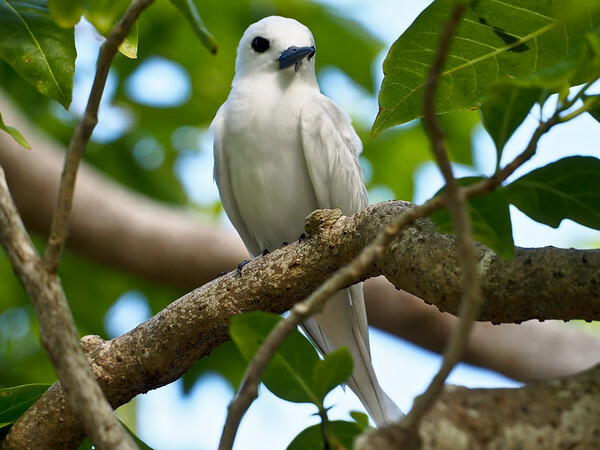 Fakarava promised provisions and internet access, both of which we needed, but we were mostly interested in the diving. 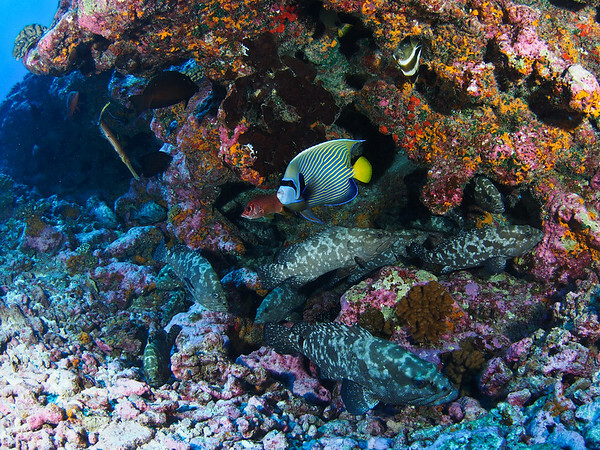 Fakarava is one of only a few atolls in the Tuamotus that is set up for dive tourism, and the atoll’s south pass is the most famous dive site in the archipelago. We wanted to get to the south pass ahead of the full moon on June 9, when we’d heard there would be many groupers, uh, grouping in the pass to spawn. Our initial destination, though, was the atoll’s north pass, which is close to its main village, Rotoava. This was 150 miles from Makemo, which we made in a mellow one night passage. Just before sunset we caught our biggest tuna yet, over 40 pounds I’m sure (I’ll have a fish scale next season). Two weeks later we were still eating it. We spent one night anchored off of Rotoava. Despite the brief stay this left a really nice impression, we enjoyed hanging out at Fakarava Yacht Services — run by a woman, Stephanie, out of her house — and biking and skateboarding around town. We next went to Pakokota, a small resort run by a guy, Matthieu, who gave us some information about diving at the south pass. After a night we went the rest of the way to the south pass, anchoring a half mile away with ten or so other boats. We spent just over three weeks here and at a nearby spot, Hirifa. 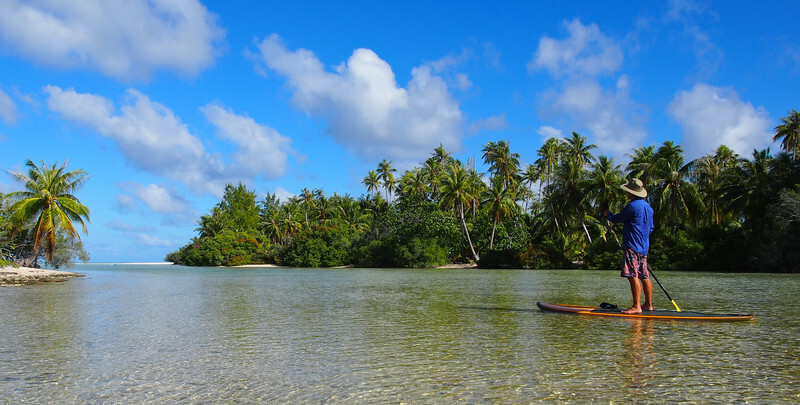 We love this area and only left because we needed to get to our destination for the season, Raiatea, where we would haul out the boat for storage and fly back to the US. We started exploring the pass the day after arriving. 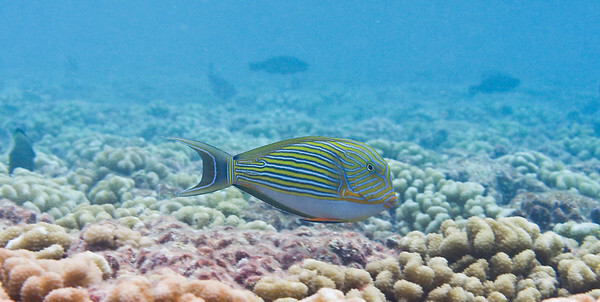 Most of the southern part of the atoll is an awash reef, but there is a series of little islands on either side of the south pass. 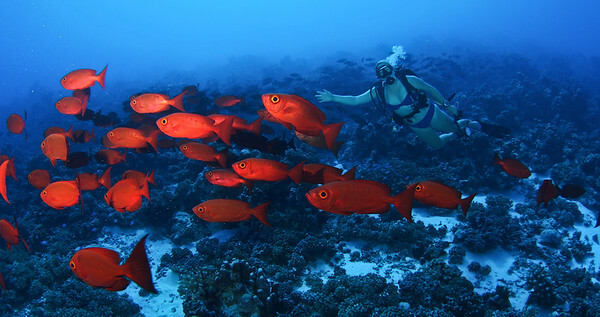 The largest is right at the pass and has a small village with a resort and a couple of dive operations. Things were still pretty laid back, and the pass never felt too busy, though a few people at the resort were diving every day and there was some hustle and bustle due to a film crew working in the pass (lots of fancy gear on display: rebreathers, scooters, remotely operated cameras) and a couple visits from a diving liveaboard. We learned how to do the main dive here by watching what the other divers were doing. There are a couple mooring balls at the mouth of the pass, where we would start our dive. Nearby is a channel whose bottom starts at 40′ or so, deepening to 90′ further into the pass, then becoming shallow. Diving on a flooding current, we stayed to the side of this channel and drifted into the pass, past the resort and into a shallow area where we zoomed above coral fields and were carried into the anchorage, pretty much right back to Magic. 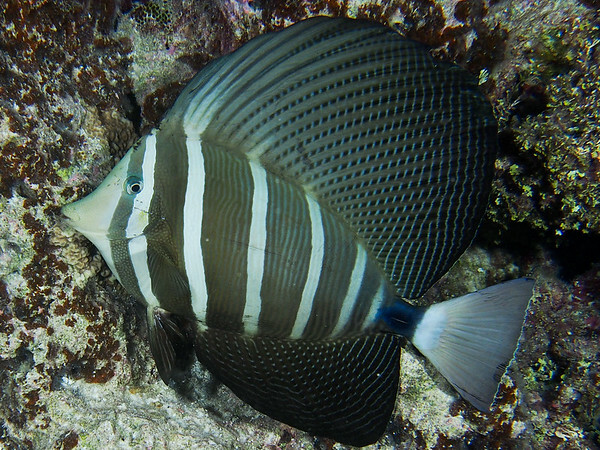 It’s a remarkably user friendly dive, and every time we went was great, never getting old or tired at all. Together we did this dive (or a variation) ten times, and I did five more dives solo. The stars of the show here are the sharks. 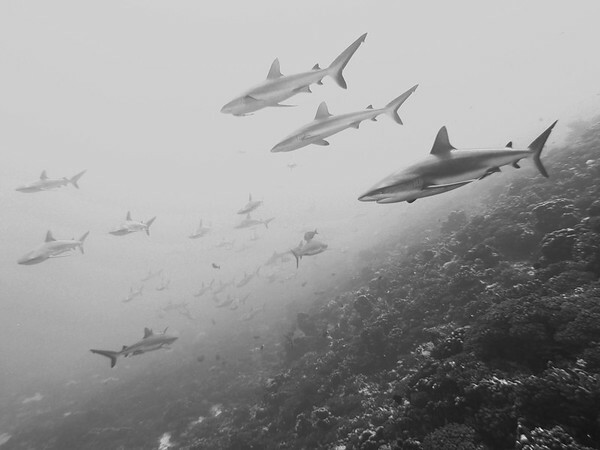 If the dive is timed right — well into the flood, when visibility is usually excellent — we would see, I’m sure, five hundred sharks, maybe more, it’s hard to count at that point. There are several places in the channel where they tend to group up and lazily swim into the current, forming incredible aggregations, walls of sharks that we stared at in awe. Almost all the sharks were gray reef sharks, with some white tips around and very occasionally other species we didn’t recognize. 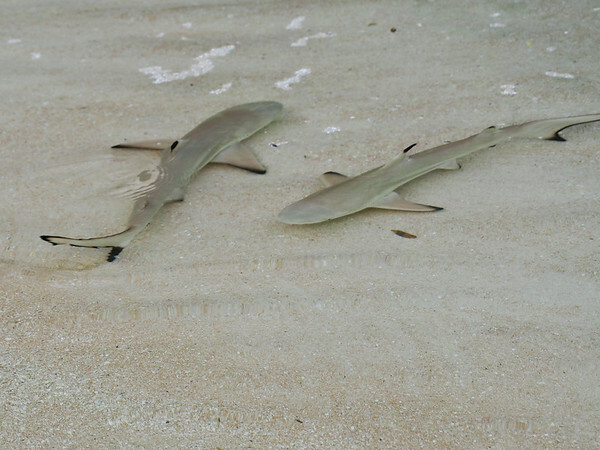 In contrast to the hunting sharks we saw at Makemo, these sharks were very mellow. They were never agitated, just swimming to stay more or less in place as the water flooded in around them. 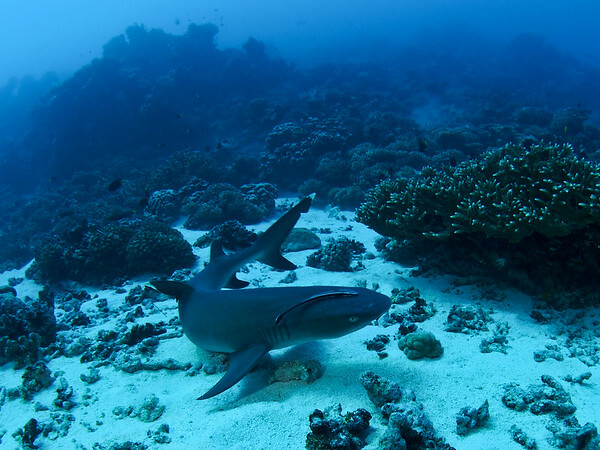 It wasn’t as exciting as Makemo, but made the sharks easier to be around and relax with, so that we could greatly expand our comfort with them as we spent more and more time in the pass. 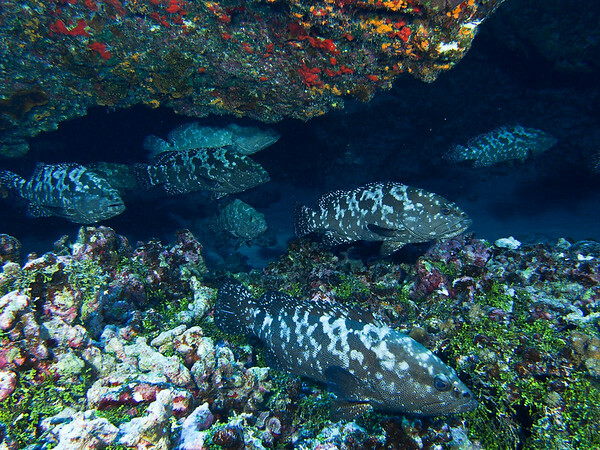 After a couple of days of diving with the sharks, the groupers started to show up. A day before the full moon we saw pockets with several groupers together, sheltered from the current and swimming more or less in place. 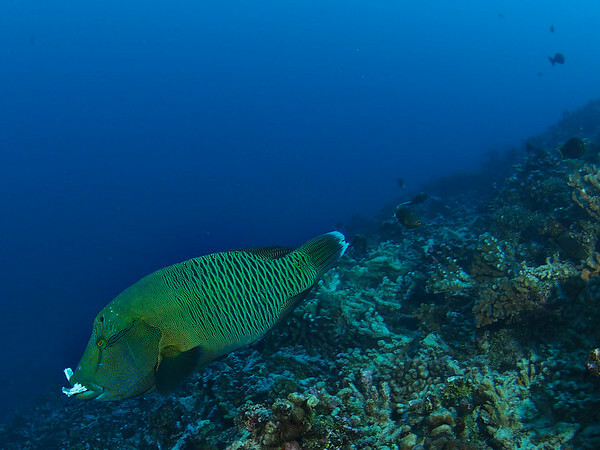 Over the next couple days their numbers increased greatly; at their peak we saw many groups with twenty or thirty groupers, and further into the pass there were several hundred carpeting the reef in one long, nearly continuous group. We never saw any actual spawning; my understanding is this happens at night, with the sharks joining in to feast on groupers weakened from their exertions. I never got up the nerve to try to see this. With this many dives in the pass we got used to seeing the other regulars. 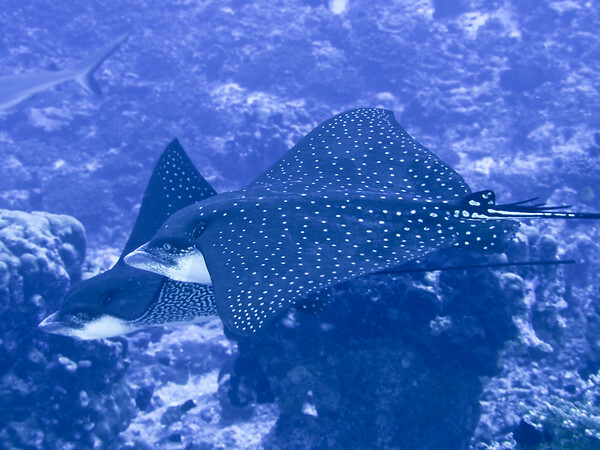 Several spotted eagle rays would usually be cruising together somewhere in the channel, and specific areas were usually occupied by a huge napoleon wrasse, whitetip sharks resting on the bottom, or titan triggerfish rooting around in the rubble. 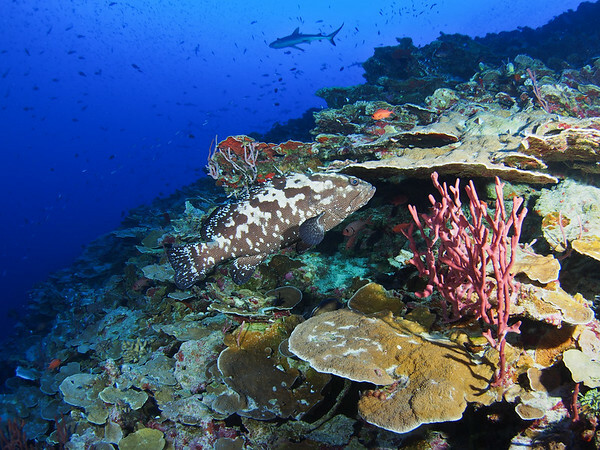 Most of the pass has very healthy coral, and the reef just bursts with life. 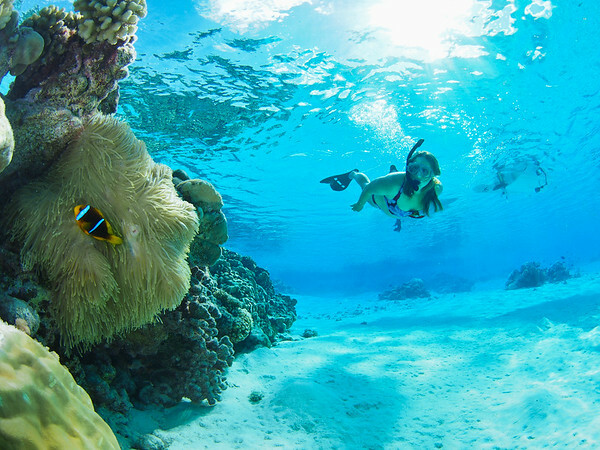 We never did much diving anywhere else, but we did a lot of exploring by snorkel. Our favorite area was some shallow sand with lots of coral heads to the west of the pass. We found a huge anemone here with an anemonefish living in it, a super cute fish which we visited over and over and took friends in the anchorage to go and see. The anchorage itself had lots of life around as well. 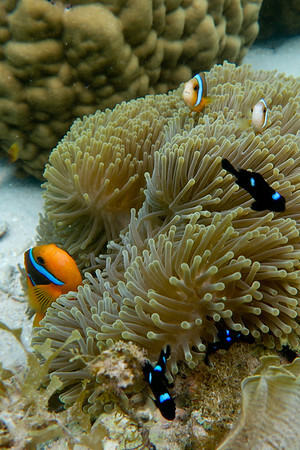 While there is little coral here, there is lots of limestone to give the fish a shelter (and to foul an anchor, alas). 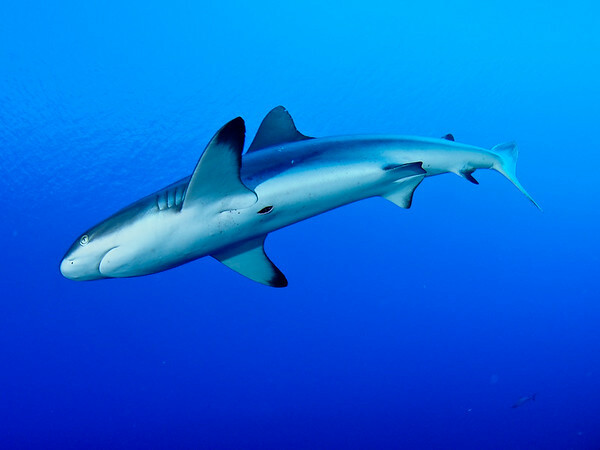 Blacktips and gray reef sharks continually cruised the anchorage, and our boat usually had a crowd of unicornfish and surgeonfish hanging out under it. 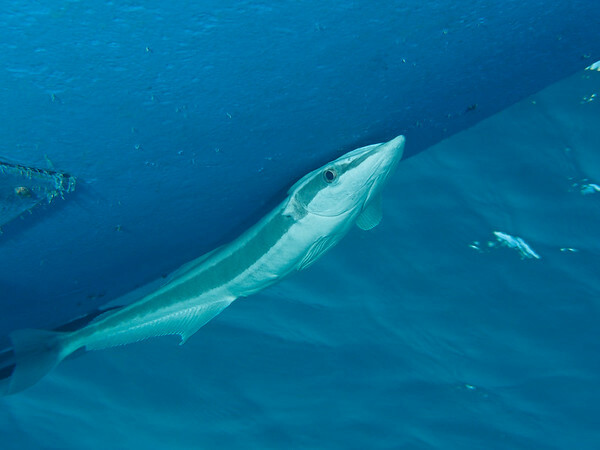 We regularly had several remoras attaching themselves to the boat with the strange suction cups on the top of their heads; they tended to be right behind the keel on either hull, where they would be exposed to the least current from the tide and from the boat motoring about. One afternoon it was dead calm and we paddleboarded around the anchorage, seeing clearly down to the bottom as if we were atop a giant aquarium; another night I went for a dive under the boat, with lots of sleepy fishes and a couple sharks following me around. Mostly, though, we just watched the fish from the boat. 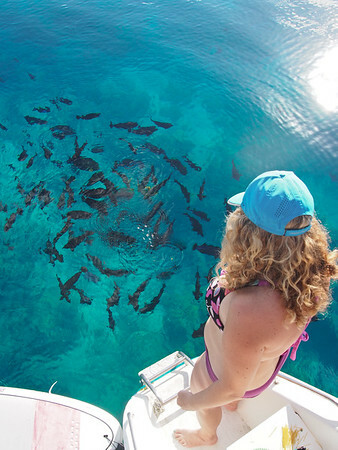 Lisa started feeding them leftover rice and such, which brought larger and larger crowds of fish, and more and more sharks (which seemed interested in catching an unwary fish, rather than the food in the water itself). The anchorage even provided us with some pets. Lisa walked the beach with a friend, Katie, from another boat, Pangaea, and took back a shell which I noticed later had a hermit crab in it. Lisa repurposed a zen garden she’d been working on to house the crab, named Pagoo. (This name had meaning for me. It came from a book I had as a kid that spurred my interest in marine biology, and from a hermit crab in a saltwater aquarium I had later on.) 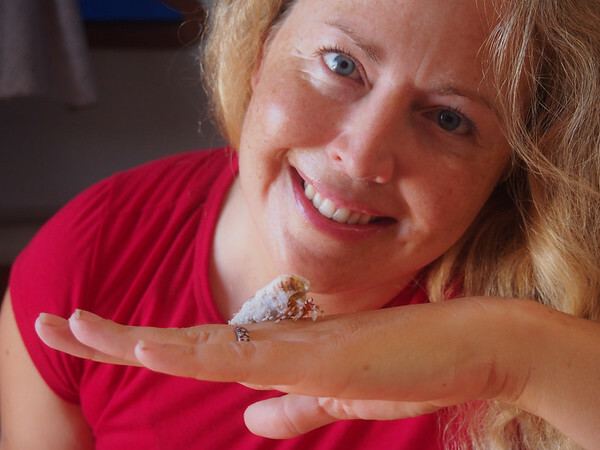 Lisa did some research and found that hermit crabs are social animals — we do occasionally see scrums of a dozen or more crabs on the beach — so went back to the beach and abducted several more to join Pagoo. We kept them until the end of the trip and it was fun to watch them roaming their enclosure or let them go on the boat for a while to explore. 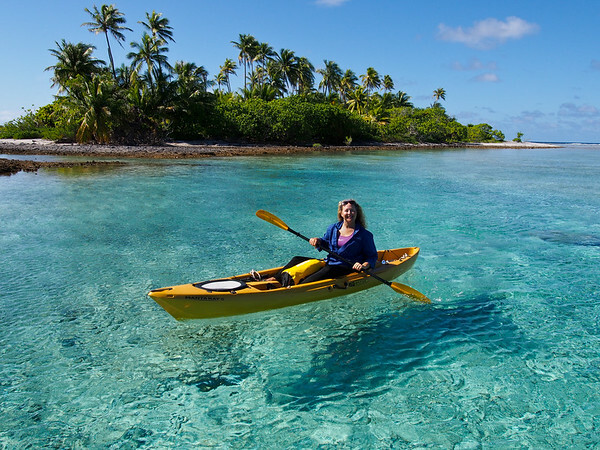 Hirifa is an anchorage at the east end of the atoll, an easy six mile trip from the south pass. We came initially to reunite with the crews of Pangaea, Shindig, Alcyone, and Tumbleweed — all of whom we’d spent time with at Makemo — and have a birthday dinner for Mike, on Pangaea, at a restaurant ashore. Between this and a later trip we stayed a total of six days here, especially enjoying paddling and hiking in some shallow, inshore, almost estuary like areas. There were a lot of juvenile fish hiding up here, and twice we saw some adorable baby blacktip sharks cruising around in ankle deep water, miniature yet fully formed versions of their relatives. Our favorite excursion at Hirifa was to a small island two miles back towards the south pass. 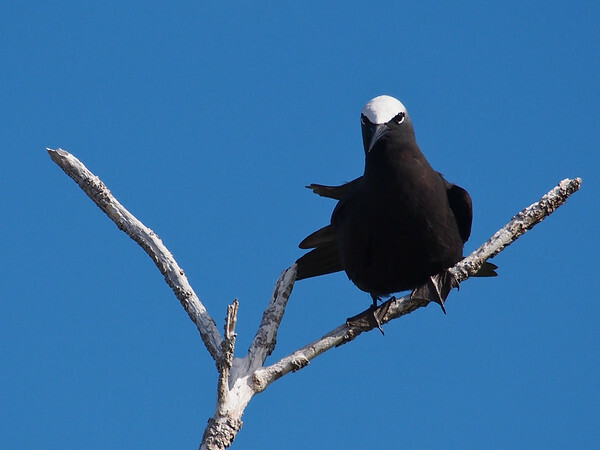 A beautiful, unoccupied spot, lots of white and black noddies were resting in the palms and other trees, while the surroundings had interesting tidepooling and great snorkeling. The three weeks we spent around the south pass were wonderful. Between here and our time at Makemo I really settled into living at these atolls. Almost every day I was diving, riding waves, or kiting, and I started pushing at the boundaries of my experience with these sports. Those boundaries, well, pushed back, most dramatically with diving. We never had much trouble in the pass, but one day I went to check out the wall outside the pass entrance. Some background might be necessary here. 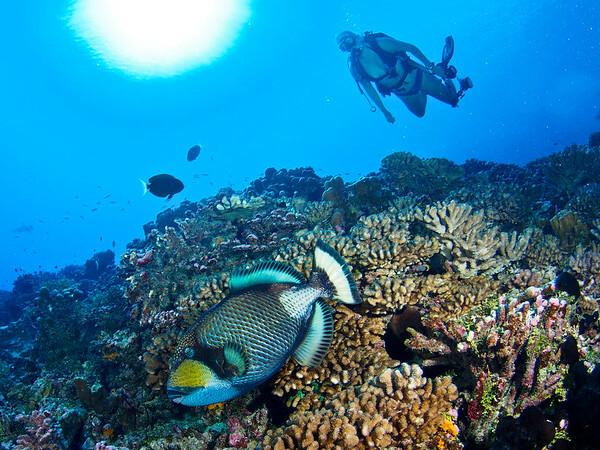 Deep diving — deeper than, say, 130′, the generally accepted limit for recreational diving — has more severe physiological effects than shallower diving. Decompression obligations accrue quickly, but more insidious is nitrogen narcosis: breathing a gas mixture high in nitrogen (e.g. air) at depth affects mental processes, unpredictably making people slower witted, unable to focus, or overly focused on one task to the exclusion of others. With similar effects to drinking too much alcohol, it is easy to go too deep or stay too long at depth. Anyways, as I started diving on the outer wall I saw dozens of sharks hanging out and a few schools of smaller fish, all above a beautiful reef that started steep and became almost vertical as it passed 100′. I decided to head down to 130′ to look around for a couple minutes before turning around. Instead, I ended up at 150′ to watch a grouper for a minute, and then impulsively decided to go even deeper. I thought it would be a good idea to go deeper than I’d ever gone before — about 180′, where I’d been several times on a rebreather long ago (using some helium in my breathing gas instead of nitrogen, which avoids narcosis). 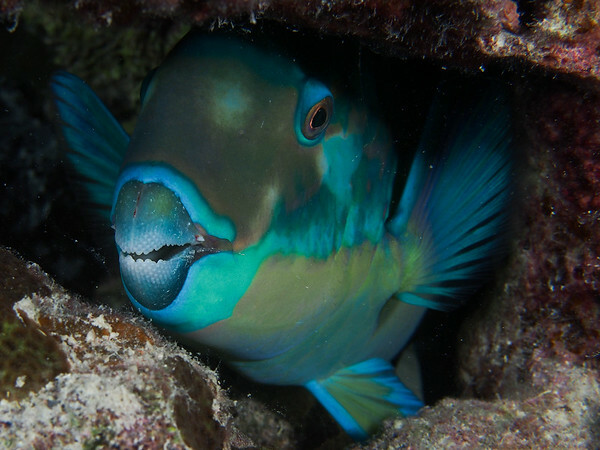 200′ seemed a nice round number, so I went down to exactly 200′, watching the reef peter off into a sand and rock slope and the water getting increasingly dark, then immediately turned around and came up to the shallow parts of the wall. Narcosis played a large role in my decision making here, but my cavalier attitude and plain curiosity led me down the wall. While I handled myself alright at depth (I ended up with one minute of decompression stops; farting around down there for just a few minutes would have left me with a half hour or much more), the fact that I decided to go that deep on a whim is simply unacceptable. I don’t want to be a cowboy diver, swimming around with little regard for my safety, and I don’t want Lisa to have to worry about me when I’m diving solo. I respect limits, and we talked afterwards and decided that I shouldn’t go past 100′ while diving like this. If I ever want to go deeper, it will need to be planned and discussed ahead of time. My trials on this dive were not over, though. As I ascended the wall, I started looked for the dinghy. When I started the dive it was clipped to my harness with a floating line, and before going deep I unclipped it and “attached” it to a piece of dead coral with a hook I’d brought (a gaff hook with the point filed off). This seemed secure so I left it behind, and now it was gone. I ascended in free water, did my decompression stop, then surfaced and saw the dinghy being blown by the wind towards shore. The waves were not too big, but with the rocky shorelines here it would not take long to damage or destroy the dinghy and outboard. I started swimming (the flooding current was helping me, at least it wasn’t accidental that I’d picked a tide where I could be separated from the dinghy and still safely return to the atoll), and after several minutes I saw the dinghy had turned into the wind and stopped drifting. This was a great relief and when I arrived I saw the float line had snagged on some coral and kept it from reaching shore. 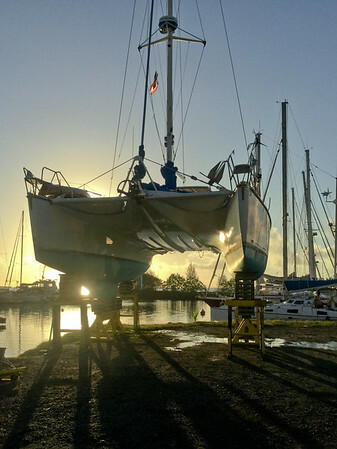 I descended again and took the dinghy out into deeper water, going through the rest of my tank at 20′-30′ as the tidal current brought me into the pass. I can sort of see this episode as karmic retribution for going deep, but it mainly reflects the layer of carefree stupidity I’d placed over these proceedings by giving the dinghy a chance to drift away. In the end, the dinghy and I made it through the dive without a scratch, due more to pure dumb luck than anything else. About a week later we had a period of higher swell with no wind at the pass, and I started eyeing the surf breaks immediately outside the lagoon. One afternoon after diving we both went ashore to see this beach; Lisa looked for shells and I put on a helmet and booties and went out to try to surf the wave. I never did get a ride, but got tumbled in the slightly overhead surf without touching the bottom, my main fear here with these reef breaks. I guess that counts as progress, and I realized that my inexperience surfing steep waves and reef breaks was a real liability here: the waves are ridable but I would have to make sure to stay on the unbroken part of the wave or I would be immediately carried into shallow water, where I could get scraped up. I started thinking about safer ways to get experience dealing with this sort of surf, and came back the next day with a boogie board, fins and helmet. For three days I went out with this setup and had a lot of success, finding a good way to get a really nice little ride and end up adjacent to deeper water where I could swim back to the starting area. This was lots of fun, and though one wave did scrape me up pretty good (I rode it straight in to the shallows and then got tumbled) it was a big confidence booster. I want to get to the point where I can actually surf waves like this, though, and am hoping to spend some time this winter in Mexico getting better at more user friendly spots. Besides diving, the main sport I did around the south pass was kiting. This was a mixed bag: I had a lot of fun going out and made some real progress in several areas, but also had some accidents and learning experiences. I went out on ten days and launched from the boat every time with no issues; at long last, I think I’ve nailed down this challenging skill. The first few times I went out were at the south pass. 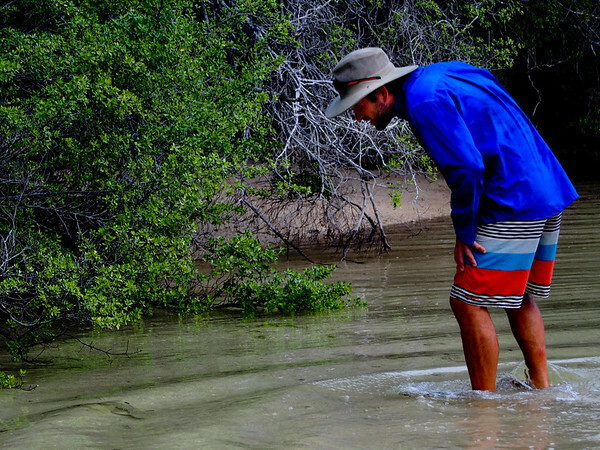 I stayed around the anchorage, checking out some shallows with coral heads and a few large bommies further out. This was nice and mellow, and I experimented a little with attaching a GoPro to the kite and getting some aerial photos of the anchorage. The rest of my time I worked on newish skills: riding a strapless surfboard and using a hydrofoil. I started to get comfortable with the former, and made a lot of progress with the latter. While I can’t say that I’m using the foil with any grace, I can now manage it and can easily get upwind if the wind is good, which will help a lot with future practice. Five of the times I went out I wasn’t able to make it back to Magic, and Lisa needed to rescue me in the dinghy. This went ok, but I hate to impose and like to be able to manage the entire kiting session myself. These rescues were mostly due to a combination of trying the new skills and generally light winds; either I was too optimistic about whether wind conditions were really suitable for kiting, or the wind dropped precipitously while I was out. I still need better judgement and light wind riding abilities (I’m hoping the foil will help with this). One of the rescues was different. Winds were pretty strong from the south (instead of the usual east) due to a weather system hundreds of miles away. They were blowing across the palms on the side of the atoll and were very gusty as a result, and I tried to go out and travel along the edge of the lagoon to find some cleaner air. This went fine until I was ready to come back to Magic, which I found very difficult due to the wind conditions and the many boats in the anchorage. I headed to the pass, then tried to cut back to Magic across a large bommie, but due to overcast conditions did not see some surface coral until I was literally right on top of it. I crashed, cutting up my hands and a foot and losing a fin off my board. I continued to kite but getting upwind to Magic was pretty hopeless and Lisa came to rescue me before long. Just because there’s enough wind doesn’t mean it’s a good idea to go out. We pushed our departure from Fakarava as far back as we could. Eventually, on June 27, we got the boat ready to go and uneventfully motored out the south pass, still stunned by the beauty of the place. 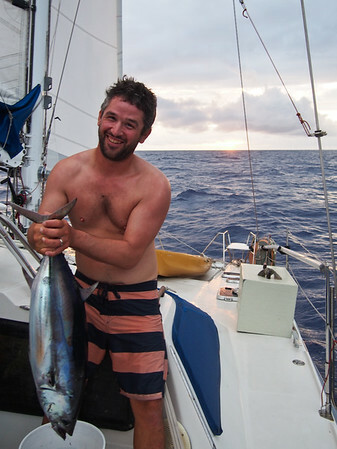 We had 350 miles to travel to Raiatea, which took three days and had some of the best sailing we’ve ever done together. Consistent trade winds most of the way, mostly clear skies with some puffy cumulus and no squalls, sailing under the spinnaker most of the days before going back to a genoa and/or mainsail at night. 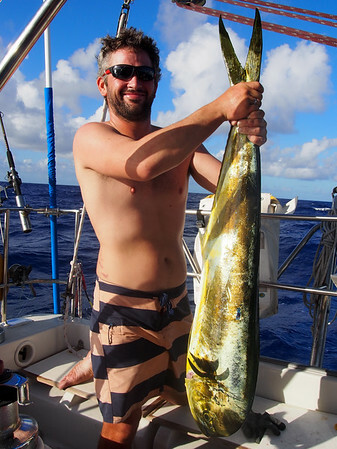 The main event was on the second day when I caught a big Mahi Mahi. This was the first Mahi I’ve ever caught, and it was beautiful to watch as I reeled it in, glowing bright blue and gold just under the water surface before repeatedly jumping out of the water as it got close to the boat. We ate its tender and delicious meat for the rest of the trip. We arrived in Raiatea with one week to haul out the boat, make some small repairs, and decommission it for nine months of storage. We also wanted to enjoy the island. This was our first time in the Society islands, which are pretty different from the Marquesas and Tuamotus. Instead of a young volcano with no fringing reef, as in the Marquesas, or an old volcano that has subsided beneath the waves and has left only a fringing reef, as in the Tuamotus, the Societies are middle aged: a fringing reef has developed, but there is still a volcano in the middle. The resulting islands are beautiful, and we wanted to see what we could of Raiatea and its neighbor in the same lagoon, Tahaa. We had another motive, too. Over the previous couple of weeks a lot of stress had accumulated, mainly due to my injuries and all the rescues I needed while kiting, but also due to a couple small outbursts I had, backslides to old behaviors of mine that are thankfully becoming very rare. We weren’t getting along well and felt trapped in a negative feedback loop; this is a bad situation to be in when confined to a boat together, and we needed to fix it. I got some relief from the stress by kiting. 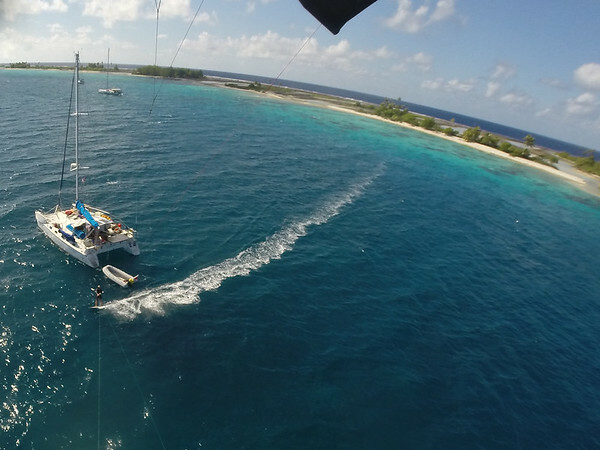 Initially we were anchored off Uturoa — the main town on Raiatea — and there was great wind at the boat every day. 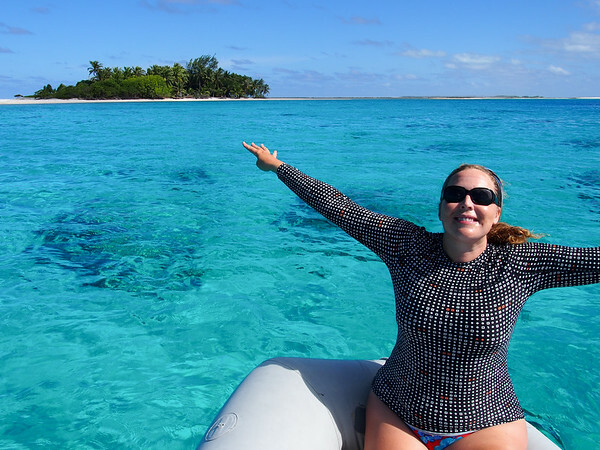 It was some of the best conditions we’ve seen in French Polynesia, and may have been a fluke or may be because this spot is in the channel between Raiatea and Tahaa, which should concentrate the wind. I went kiting from the boat four times, riding conservatively and without incident. Each session was an hour or less, but just getting out and enjoying the flat, blue lagoon water, the sun on my skin and the wonderful temperature of the air and sea, was a profound experience. I wasn’t ready to leave the country. 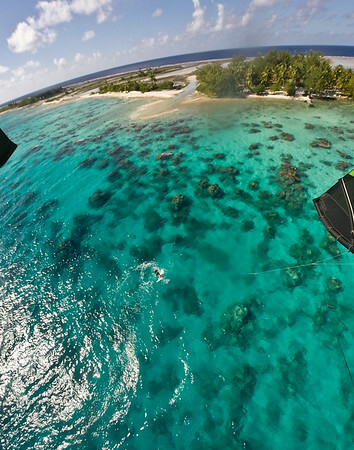 Kiting was an escape, however, and really only exacerbated our problems. Lisa felt I was prioritizing it over activities we could do together, and while that was not my intention I think she was right. We came up with a couple new rules to avoid the problems we’d been having with kiting: activities we do together need to have top priority, and I need to take a break from kiting when it starts causing trouble in our relationship. With the rest of our free time we saw what we could of the island. We walked around Uturoa several times, enjoying the town and especially a dance we happened upon, with dozens of people performing a tightly choreographed, physical routine that went on continuously for nearly an hour. 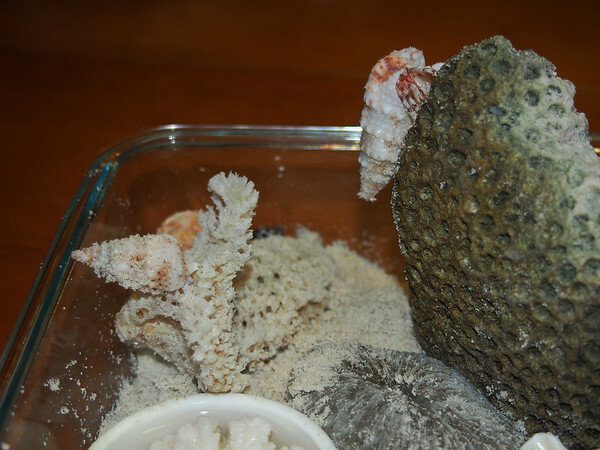 We also found an island where we could release our pet hermit crabs, and went snorkeling at a few spots. 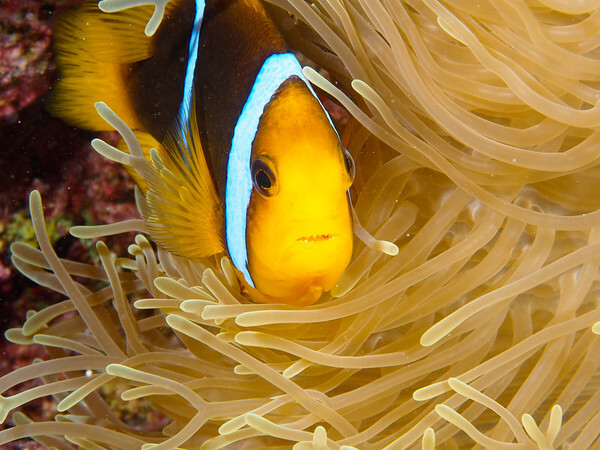 We never found visibility, fish life, or coral comparable to the Tuamotus, but conditions were still nice and we saw a lot of anemones and anemonefish. 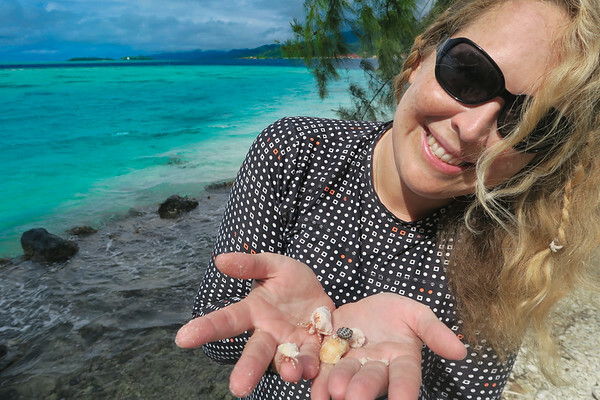 Finally, on our last full day in French Polynesia we did a full day tour with a company, Arii Moana Tours, circling Tahaa and visiting a pearl farm and vanilla plantation among other activities. We had a great time and felt like these trips and the talks we’d been having did a lot to heal the rift we were feeling. We hauled out of the water the day before the tour, a smooth and well run experience at CNI, one of the two yards on Raiatea offering long term boat storage. This left us with one day to finish decommissioning before we flew out of the country. Since we’d done a lot of work while we were still in the water this should have been pretty easy, but I was pretty sick and we worked almost to the end to get the boat ready. Finally, in the late afternoon we left and started 20 hours of travel to Salt Lake City. Together, the three weeks we spent crossing from Mexico and the following three months in French Polynesia formed an experience that changed my life. Seeing how people live at these uncrowded islands, surrounded by such stunning beauty, and how we were able to navigate this place in comfort with no significant problems, has opened a door for me in terms of what is out there in this world and what we can see and do with some determination and skill. Now that I’m back in the US, things just look and feel different than they did before. I guess I’ll see where this goes, but for now I’m looking forward to flying back to the boat next year for another six months in French Polynesia.